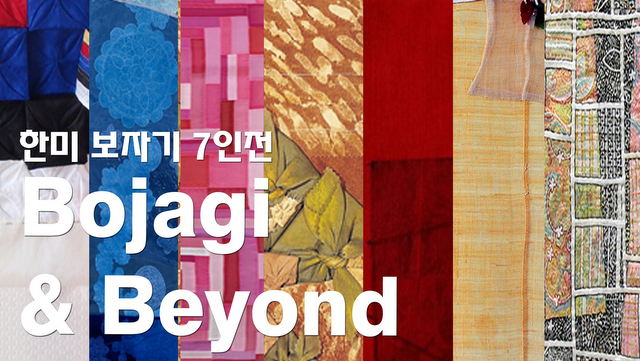 Join us for the opening of Bojagi & Beyond, a new exhibition showcasing the artistry and originality of the traditional quilted Korean wrapping cloth, bojagi! Bojagi & Beyond features works by seven Korean and American artists presenting both traditional domestic style and contemporary artistic bojagi creations. The exhibition highlights traditional textile techniques of Korean artists and the true meaning of bojagi along with the modern reinterpretations of this centuries old family tradition. The opening reception event will include guest presentations by Lee Talbot, curator of Eastern Hemisphere Collections at the Textile Museum in Washington D.C. entitled “Bojagi in Cultural Context”, and guest curator Chunghie Lee entitled “Bojagi Today.” Guest are invited to join the artists and presenters for a light Korean reception and gallery viewing afterward. Bojagi (보자기), a traditional Korean wrapping cloth, is a centuries old Korean folk tradition that utilizes patchwork textiles for both everyday use and ceremonial purposes. Bojagi are traditionally hand-made by women in the domestic realm to fulfill a practical need for wrapping items to carry, but also artistic expression. In recent years, the technique has gained interest outside Korea due to the popularity of handmade crafts, use of recycled materials, do-it-yourself activities, and sustainability in textiles and contemporary art. A free RSVP is required to attend the opening reception event (scroll down to RSVP). Soon Hee Kim is director of Chojun Textile Quilt Art Museum (www.jculture.co.kr/museum) located in Seoul, Korea and has worked with a wide variety of bojagi, both traditional and modern. Ji-Hee Kim is director of the Museum of Natural Dye Arts in Daegu, Korea (www.naturaldyeing.net), and exhibits various natural dye materials. Ki Ok Park is the director of Shuim Museum in Seoul, Korea (www.shuim.org), and works with hyper sensitive traditional Korean fabrics. Jisun Cha is a professional bojagi artist and has been hand crafting all of her artworks since 2000. American artistMary Ruth Smith has been studying and spreading bojagi culture and techniques with her students at Baylor University in Texas. American artist Nancy Crasco is a professional Bojagi artist who has presented her creative pieces at the 2012 Korea Bojagi Forum held in Korea, along with fellow artists from Sweden and South Africa. Lee Talbot is curator of Eastern Hemisphere Collections at the Textile Museum in Washington D.C Previously he was curator at the Chung Young Yang Embroidery Museum of Sookmyung Women’s University in Korea. Guest curator, artist, and presenter Chunghie Lee, who coordinated Bojagi & Beyond, has been promoting bojagi culture and crafts in many countries including the United States, England, Australia, France, Netherlands, Finland, Switzerland, and Canada through various exhibitions, lectures, and workshops.